Disney's Lady and the Tramp canoodled over a plate of spaghetti and meatballs. 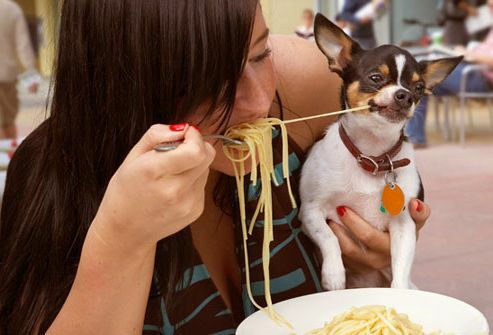 Your pooch can have pasta once in a while, too. Just make sure it's plain and cooked. 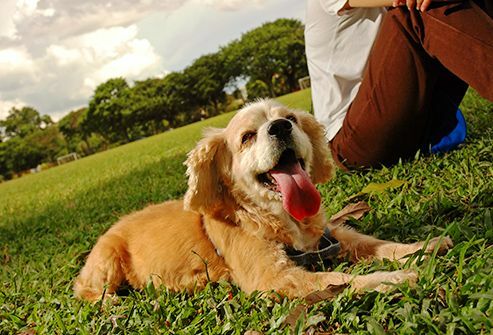 Brown rice is a healthy whole grain your dog may gobble up. Mix some into her regular dog food to liven up her meal. 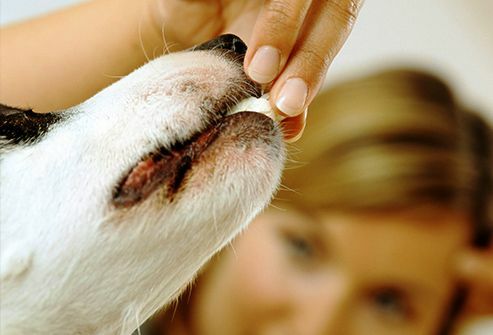 Make human food a treat for your dog -- it should be no more than 5% to 10% of her diet. The rest should be dog food, which supplies the nutrients she needs. Always cook meat well. Never serve it raw or undercooked. Avoid fatty cuts, including bacon. Cut meat -- and any human food -- into easy-to-chew chunks. Ground meat is fine, too. Old, moldy, or spoiled meats are not OK. 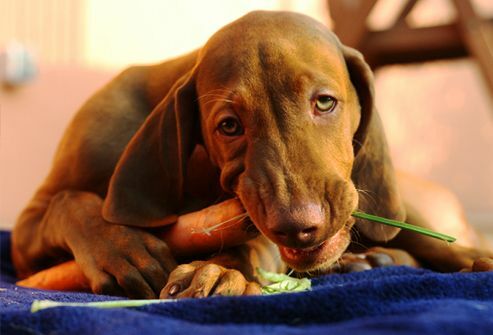 Vegetables give your pup vitamins, fiber, and some canine crunch. Try serving these raw veggies grated or finely chopped: carrot, cucumber, zucchini, lettuce, bell peppers, corn (cut off the cob), and celery. Or steam these favorites: green beans, broccoli, asparagus, cauliflower, and hard winter squash. Skip avocado, which can upset her stomach. Don’t give any vegetable or other human food that seems to cause tummy trouble. Mix 1 cup of peanut butter (unsalted is best) with half a mashed, ripe banana or a little water. Drop by spoonfuls onto cookie sheets lined with wax paper and freeze. Bite-sized bits of whole wheat bread are good for her gut health. 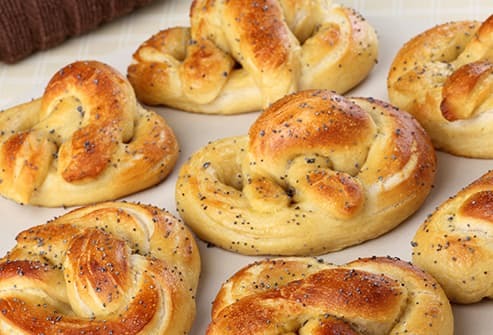 But don't give her raw dough -- it can cause serious stomach problems. She might also go for some pieces of unsalted pretzel. Just skip the salted kind, which can make her extra thirsty and can cause big problems if she eats a lot. Except for grapes and raisins, most fruits are OK for your pup. 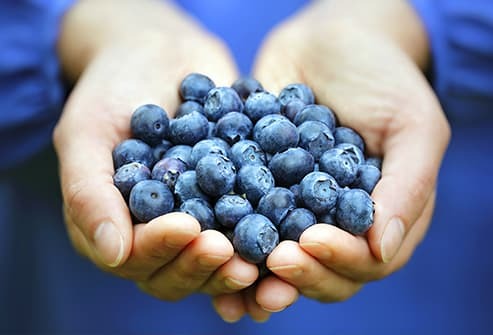 Try slices of fresh banana or apple (without the seeds), chunks of cantaloupe or watermelon, blueberries, or orange sections. Scrub and skin sweet potatoes and slice them into 1/2-inch strips. Put the strips on parchment-lined cookie sheets. Bake at 225 F for 3 to 4 hours -- or longer for crunchier treats. Some dogs resist taking pills, especially if they’re big or smell bad. To make one go down easier, hide it in a tasty treat -- like peanut butter (check for xylitol if using low-calorie peanut butter -- it can be toxic) or a marshmallow. Make pill time game time if she likes to play catch. Toss her a few pieces of what you plan to hide her meds in, one after another, with the pill in one of them. She may swallow it without even knowing it was there. Ground beef and chicken are other good hiding places. If none of these works, it's OK to use a slice of hot dog. Ask your vet for other ideas. Give a Dog a Bone? It's better to stick to chew toys. 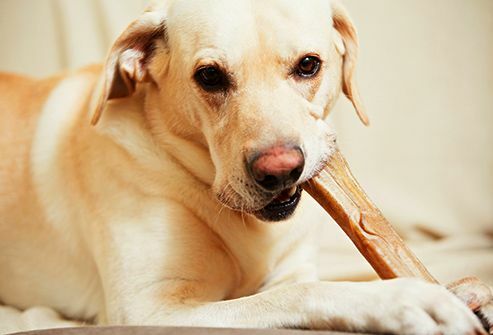 Chicken and turkey bones aren't safe for dogs, because they can splinter into sharp pieces easily. But what about big lamb or beef bones? Experts say even those aren't a good idea. Bits of raw meat on bones can have disease-causing germs. Even with cooked bones, splinters or large pieces of them can break off. Both can seriously damage your dog's digestive tract. Too much holiday food is a recipe for doggie distress. But you can give your hound a taste of your celebration. He'll be plenty thankful for tidbits like well-cooked turkey, green beans, and cooked sweet potato in his regular chow. Skip table scraps. They may have ingredients he shouldn't have -- like milk, onions, or garlic. Keep chocolate and cocktails above licking level. Both are toxic. 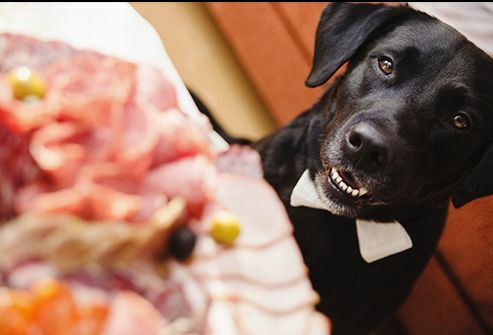 American Veterinary Medical Association: "Raw or Undercooked Animal-Source Protein in Cat and Dog Diets," "Raw Pet Foods and the AVMA's Policy: FAQ." ASPCA: "Pet Nutrition Service," "How to Stuff a KONG Toy," "Foods That Are Hazardous to Dogs," "People Foods: Pretzels," "Giving Your Dog a Pill," "Thanksgiving Safety Tips," "Foods to Avoid Feeding Your Pets." 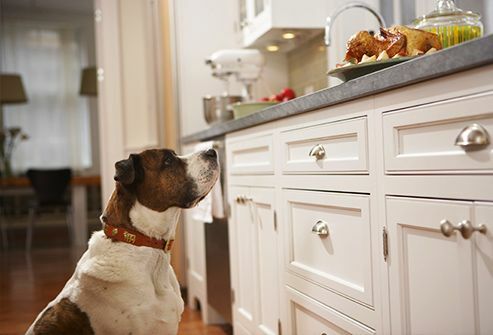 ASPCA Action: "Top 10 Nutrients Your Pet Needs." Humane Society: "Peanut Butter Popsicles," "Sweet Potato Jerky." Michigan Humane Society: "Chocolate and Bones: Two Serious Dangers for Your Dog."